Size: approx. 8 mm. Photo: 06/16/14, 10 pm. The signaling behavior of this species is unique. The males hover about two feet above the ground and then drop down to emit a single prolonged flash during the subsequent ascend. Flashing occurs at dusk and earlier than for related species. As for other fireflies the light signal attracts females. 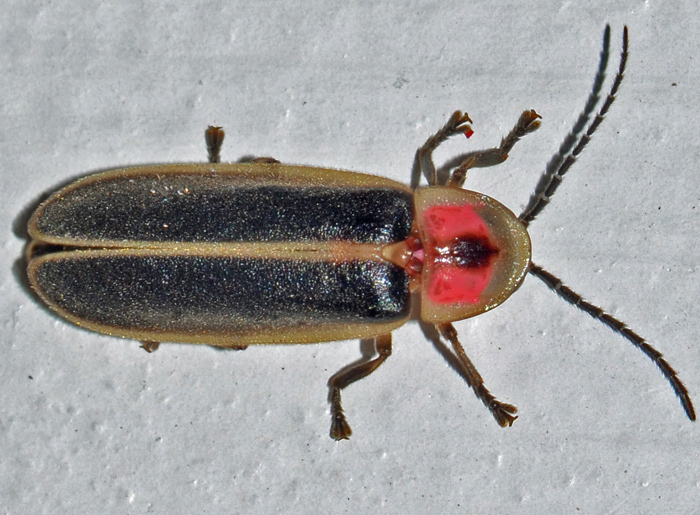 From wikipedia: "Illegitimate receivers, such as female Photuris beetles, identify these signals and use them to locate the male Photinus, attract them with deceptive signals, and eat them." Adults do not feed. Females rarely fly.